The weather was key to making this a classic race, and there was no rain in sight as the ninety minute event unfolded. A dominant Sebastian Vettel took victory, but there were other things to enjoy during the afternoon. 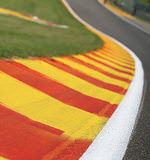 How do you rate the Belgian Grand Prix? The 2013 race at Spa was one that promised so much, but did it deliver? There was plenty of action in the first few laps, and we later saw some switching strategies and plenty of overtaking moves. There was even a crash and a couple of retirements to spice things up as well. But the lack of rain left the end slightly dull as Vettel scampered to an easy win. The on track action was under scrutiny by the fans and the stewards, as a few penalties were handed out. Off track, there were a few uninvited visitors trying to get their point across. The stewards were kept busy today, analysing a couple of incidents and handing out penalties. Thankfully they did them all mid-race rather than waiting until afterwards, but each decision was still a controversial one. Sergio Pérez's drive through penalty for pushing another driver off track was particularly divisive - do you think they were right? Five stars for a good decision, one star for the stewards being harsh. Environmental activists dropped in on to the top of a grandstand before the race and lowered a banner to protest against Shell's drilling actions. Post-race, they tried to get on to the podium but were kept off the television broadcasts. Was this a decent protest or should they have thought this through a bit more? Five stars for a nice peaceful protest that didn't hurt anyone, or one star for annoying fans of a sport they weren't protesting about anyway. Now it's time to select your driver of the day. As always, we've picked out a handful of stand-out names, but if you disagree, that's what the comments are for. Who was your driver of the day in Belgium? Feel free to keep your selections anonymous, but even better, why not share them? Discuss your choices in the comments, or share each rating to Twitter.